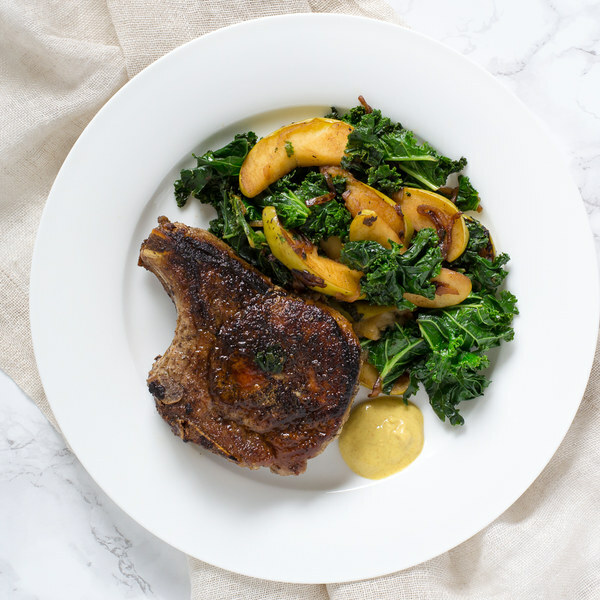 ← Pan-Fried Pork Chops with Apple & Kale Sauté. Quarter the apples lengthwise, then cut out the core and stem from each section; cut each quarter lengthwise into 4 thin wedges and transfer to a medium bowl. While the skillet heats up, pat the pork chops dry with paper towels and place on a plate; season generously with salt and pepper on both sides. Place the pork chops in the skillet and sear until they develop a nice crust, 2 to 3 minutes per side. Then, reduce the heat to medium and cook the chops, flipping occasionally, until they are cooked through (test using a thermometer or cut into a chop with a knife), another 3 to 5 minutes. Once done, transfer the pork to a plate. While the pork chops cook, trim off and discard the ends of the shallots; peel and halve the shallots lengthwise, then thinly slice crosswise into half-rounds and leave on cutting board. Once the pork has been transferred, add the shallots to the skillet; cook, stirring frequently, until softened, 2 to 3 minutes. Add the apple slices to the skillet; cook, stirring occasionally, until they are lightly browned and just tender, 3 to 4 minutes. While the apples cook, cut out and discard the stems from each kale leaf; chop leaves crosswise into 1-inch strips. Add the kale and ½ cup of water to the skillet; cook, stirring frequently, until it is wilted, 3 to 4 minutes. Once done, remove from the heat. Drizzle the kale with apple cider vinegar and season with salt and pepper. To serve, divide the pork chops and sauté between plates. Add a dollop of mustard on the side for the pork if desired. Enjoy!